Camp Hale is the only site developed by the United States Army specifically for mountain and winter warfare training. The location provided natural features necessary for training and convenient access by both a Federal Highway and the Denver & Rio Grande Western Railroad. The large open valley accommodated the more than 1,000 buildings and structures as well as parade grounds, weapons ranges and much more. Location. 39° 26.168′ N, 106° 19.32′ W. Marker is near Red Cliff, Colorado, in Eagle County. Marker is on Camp Hale 1 (U.S. 24) near Camp Hale Spur 1B, on the left when traveling south. Touch for map. The site is approximately 8 miles South of Red Cliff, CO and 16 miles North of Leadville, CO on the East side of US 24. Marker is in this post office area: Red Cliff CO 81649, United States of America. Touch for directions. Other nearby markers. At least 8 other markers are within 9 miles of this marker, measured as the crow flies. Norwegian Memorial (approx. 5.2 miles away); Office of Stratigic Services (O.S.S.) NORSO (Rype Group) Special Force (approx. 5.2 miles away); 10th Mountain Division Memorial (approx. 5.2 miles away); Kokomo Masonic Lodge (approx. 7.7 miles away); Vail / Vail Pass Country (approx. 8.4 miles away); Mount of the Holy Cross (approx. 8.4 miles away); 10th Mountain Division (approx. 8.4 miles away); Fremont Pass (approx. 8½ miles away). More about this marker. This marker is located in a set of 3 historical markers about Camp Hale. Regarding Construction of Camp Hale. The markers are visible from US Highway 24 on the East side. More. 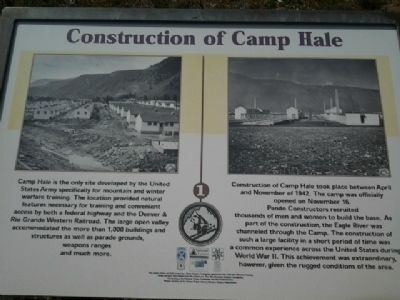 Search the internet for Construction of Camp Hale. Credits. This page was last revised on July 21, 2017. This page originally submitted on August 24, 2013, by Dan Peterson of Glen Allen, Virginia. This page has been viewed 864 times since then and 13 times this year. Last updated on October 9, 2013, by Dan Peterson of Glen Allen, Virginia. Photo 1. submitted on August 24, 2013, by Dan Peterson of Glen Allen, Virginia. • Bill Pfingsten was the editor who published this page.